Our Psoriasis Home Treatment will astound you. "Bet you can't treat this , though!" but unfailing we have. It's not surprising that people are sceptical though, since all allopathic medicine has really come up with in terms of creams are steroid ointments that thin out the layers. Gradually day by day the steroid ointment will weaken the skin and make it papery, fragile and simply weaker. There are new psoriasis treatments available in injection form now but research has shown that while the skin condition may improve these tretament can have catastrophic effects on your general health. It's no wonder that people turn to home remedies for psoriasis. At The Apothecary we use Cajuput oil. Not easily recognised in this country it is a medicine that is widely used in Australia. It comes from the same family as Tea tree and is superb at treating psoriasis. This psoriasis home treatment comes in the form of a wax based ointment. It is none greasy and forms a lovely soothing waxy cover over your patches. This has two benefits to you. 1. It moisturises and softens the scaling, which you can see immediately. 2 It calms down the itching and soreness - again miraculously you feel a difference within minutes of using it. In addition to the waxy consistency, we have added lavender and camomiles oils to soothe down the itching and inflammation. My favourite oil in this blend is myrrh oil though, because it works so hard! It is an amazing skin healer and within days you can see just how well it has mended great big fissures in the skin. It is so effective at mending the skin that you will want to keep touching it I can tell you! I tell you now...people will comment on how fast it is improving. As with all new psoriasis treatments, I recommend using more for the first few days than you usually would so you can get a really good build up of oils in your system. Perhaps use it as much as five times the first day but after that just use it morning and night or as and when you need relief. Unlike many home remedies for psoriasis, it actually doesn't smell too bad. Something about this complaint seems to give scientist free reign to make products that....well frankly stink! In actual fact the fragrance doesn't stay around very long at all because the essential oils absorb through the skin and into the blood stream so there is only the wax that stays on the surface. OPnce in the blood stream they flush around the system and migrate to the places that need them most. Now this is important because it means that you only have to put it on a couple of the worst affected places and it will treat the whole body. Remember it is the oils that do the work, not the wax. So a couple of dabs is a portion for the entire body, pick a couple of bad places, smother on the cream and you will see improvement in the other places too. Amazing really, even though I have been watching it work for years, I still think it is clever. Mother Nature and her magic oils are a force to be reckoned with I can tell you. If you have concerns about the safety of essential oils I reccommend you read side effects, you may find it puts your mind at ease. As ever I will reiterate to you that this is a risk free purchase for you. But I would rather recieve a letter from you, like we have had from many. many suffers asking for another pot of Psoriasis home treatment because they would not be without it! Put an end to the suffering today. 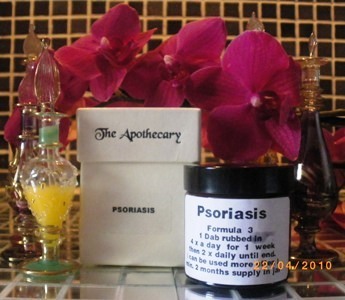 The Psoriasis Home Treatment is just one of products made by the Apothecary. Go Shopping!